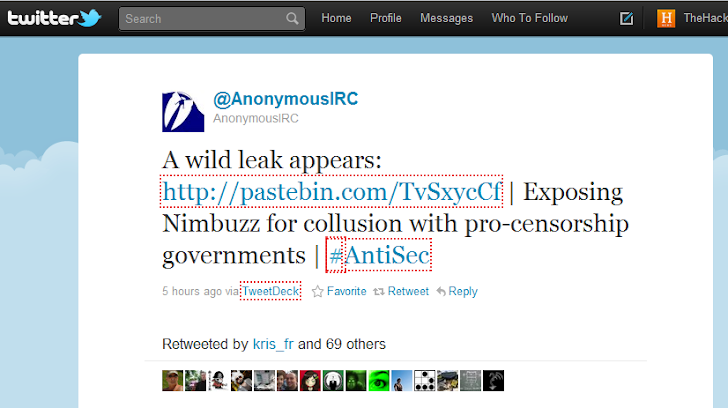 Anonymous Hackers leaks Nimbuzz data via the twitter account of AnonymousIRC which included a link to their latest leak from Nimbuzz http://pastebin.com/TvSxycCf. About thirty minutes later, that twitter account posted a link for download named "antibuzz" along with an invitation for everyone to join Anonymous IRC. Nimbuzz is a Dutch company that provides services similar to Skype, Including text and video communication.The pastebin release claims that Nimbuzz is "capable and self-admittingly willing to co-operate with governments to help censor the public's use of the very services they offer." Anonymous Says "People should not be afraid of their governments. Governments should be afraidof their people. ".